Like City Hall, Lotta's Fountain is old and new. This landmark, where Kearny and Geary Streets meet at Market, is the annual site of early morning ceremonies commemorating the 1906 Earthquake and Fire and was recently renovated. 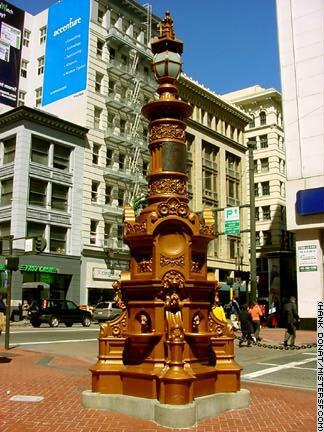 The fountain was given to the City in 1875 by Lotta Crabtree, a popular vaudeville performer. It became a meeting point for separated families during the quake and was the site of a Christmas Eve performance by the opera singer Louise Tetrazzini in 1910. See an amazing Before and After restoration photo of Lotta's Fountain!